• Total power to 600 Hp in counter rotating application. • Transom or hull mounted cylinder. • Speeds to 60 mph maximum (97 km/h). • Fits engines with/without support (steering) tube. b) the total engine power to be installed. 2. Select the cylinder and tie bar kit required. 3. 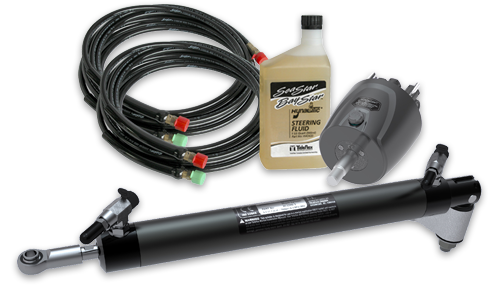 From the order guide select the appropriate helms and accessory hardware for each steering station. 4. From the order guide select the fitting and hose kits required. You will have to determine the configuration, length, number of hose and fitting kits required for the installation (see Hose section). 5. Confirm that there is sufficient space available in the splashwell and dash areas for the steering components. e) the power exceeds maximum Coast Guard or M.O.T. recommendations for the boat. The splashwell mount cylinder (part no. HC5380) can be used on all engines complying with ABYC P17/NMEA/BIA standards provided they have a threaded attachment hole (3/8″ – 24 UNF thread) in the steering arm. Not suitable for use on engines fitted with factory power steering. ENGINE/CYLINDER CONFIGURATION DESCRIPTION QTY. REQ. MODEL PART NO. Applications up to 300HP Max. Non-Counter Rotating Applications up to 300HP Max.